The Club Khaosan officially opened in 2007 and is now one of the most vibrant nightclubs in Thailand. It is situated in Khaosan Road, a popular nightlife disctrict in Bangkok. 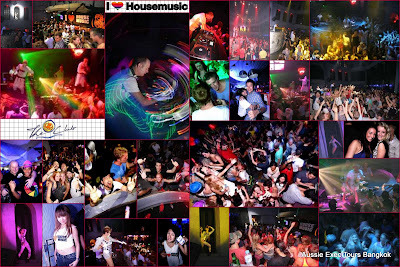 The crowd at The Club Khaosan is usually a friendly and happy mixture of people who like to drink and dance to the latest electronic dance music spun by professional DJs who specialize in such genres as house, drum 'n' bass, techno and trance. Tourists are cordially welcomed to join in the fun! The Club Khaosan's powerful high-quality sound system makes everyone feel the music to its fullest, and state-of-the-art lighting and lasers create a fun and exciting atmosphere. Expect to see hands in the air, jumping and cheering! The venue consists of a huge dance floor and a 2m high DJ booth surrounded by a small stage. Special events, often with DJs from other parts of the world, are held often. The Club Khaosan is open from 22:00 every night of the week. For details on how to get here, see the Contact page. Entry is usually free, so come and check us out!